We present to you a list of 5 legendary players from the 90's, who would have made the T20 game EPIC!!! Take a look to know if your favorite player has made the list. Sanath Jayasuriya has been at the vanguard of Sri Lanka's ascent as a cricketing power, and his rise as a feared international batsman coincided with Sri Lanka's rise as a force to be reckoned with in international cricket. The man didn't play a T20, but with his explosive Powerplay focused batting he played every ODI like a 15 over match! He made a mammoth 340 against India in 1997. He is only the second man to have scored over 13,000 runs in ODIs, and he has got those runs at a strike rate of over 90. He also has 322 wickets in ODIs, with four 5-wicket hauls and stands 9th on the list of all-time wicket-takers in ODIs. While his legendary big hitting is enough of a reason to make him a top T20 pick, his left arm spin is more than handy to slip in a few quit overs or break a partnership. Couple all that with his excellent fielding which is so important in T20s and you have an absolute winner on the cards. 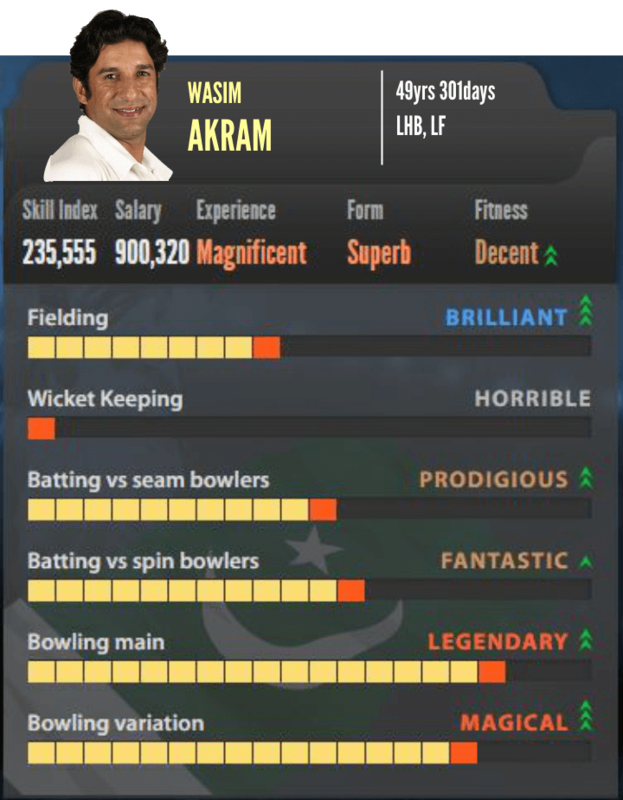 Regarded as the best Left arm pace bowler of all time, Wasim Akram was the leader of the formidable Pakistani pace attack of the 90s. His ability to move the ball both ways and hammer that all important Yorker made him a particular good death bowler. He was not slack with his batting either, often getting those big hits lower down the order. Perhaps the most crucial aspect to his value is his Big match temperament. A man was the big occasion, he often turned the match on his head and played a phenomenal role in Pakistan winning the ’92 World Cup. He would surely be the Lynchpin of any T20 team today. “Mr. Electric Heels” they often called him. Regularly dubbed the world's best limited-overs batsman, Michael Bevan was master of run chases. In the age where most of the batsmen are tuned to high-risk shots, his ability to anchor the innings but still move at a high Strike Rate would be invaluable to any T20 outfit. Picking the gaps, running hard and knowing the right moment - and place - to hit a boundary were the hallmarks of his success. Teams just couldn’t defend a total while Bevan was still at the crease and with his band of low-risk stroke play, teams just couldn’t get him out! South Africa may be perennial under achievers, but Klusener was the one-man army who threatened to change that with both Bat and Ball, lighting up the ’99 World Cup in the process. His baseball-style backlift and thunderous hitting symbolized the tournament and his heroics nearly took South Africa to the final. His heavy bat that sent the ball arcing to all fields and his introspective nature would definitely fetch a top dollar if he was to be sold in this years auction. And that is the precise reason why he grabs a place in our list. An exuberant batsman, and an incorrigible charmer off the field, Ajay Jadeja entered international cricket with an infectious effervescence that won hearts and matches - but left behind an eerie trail of bookmaker connections and unanswered questions. A protégé of Kapil Dev, Jadeja's natural athleticism, energetic running between wickets, audacious big-hitting and winning smile were made for the floodlit age. His bustling, street-smart batsmanship in the middle and closing overs swung many one-dayers India's way, none more emphatically than the 1996 World Cup quarter-final against Pakistan, when he blasted 45 off 25 balls. A true game finisher, a cool minded player and a fantastic fielder, Jadeja would definitely make a great addition to any T20 squad. This was our view on the heavy-weights that would have made the game more entertaining. Who do you think should have been on the list? Another great post from you guys!!! lol, Jadeja was a batsman, and a part time bowler, more or less like raina/kohli. 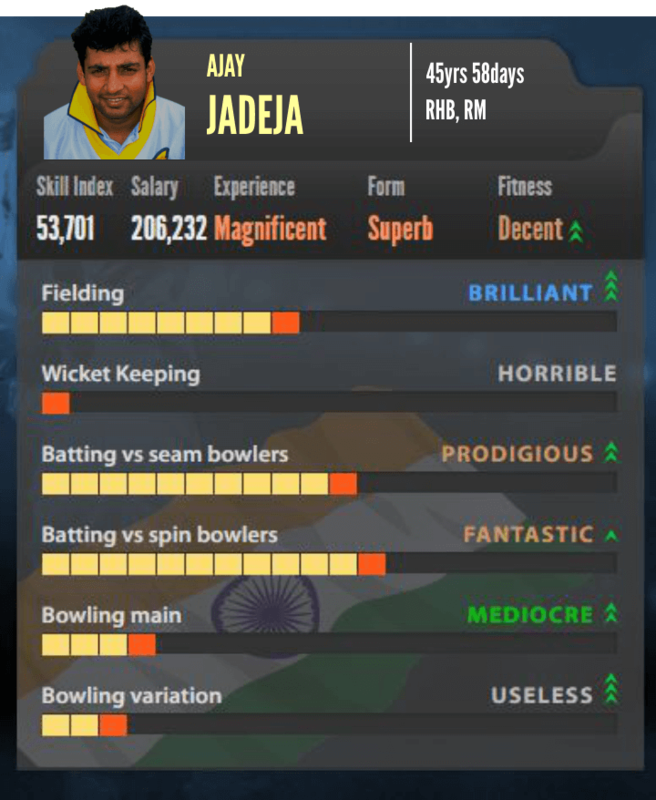 skills for jadeja are much much lower. He should atleast be on par with someone like Bevan. You Guys missed a Legend -- ANDY FLOWER!!! No West Indies stars like Viv (who could murder any bowling attack) or Ambrose (With his 2 mts height its impossible to hit him)? Shahid afridi instead of jadeja. Perfect all rounder for t20.